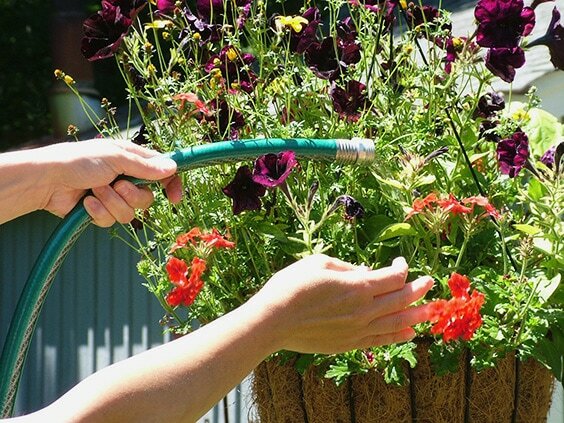 Are you wondering if you’re watering your plants too much? Or maybe not enough? It’s a common worry with gardeners and homeowners, but to answer these questions would depend on whether we’re talking about indoor or outdoor plants. And because we’re awesome and love to provide our visitors with the best source of information possible, I’ll review the detailed breakdown of both. That way, whether you’re dealing with window herbs, houseplants, or an outdoor veggie patch, we’ve got you covered with these tips on watering plants. HOW DO YOU KNOW IF YOUR PLANTS ARE DEHYDRATED? Watering outdoor plants can be tricky business because you don’t have the control like you do with indoor ones. Rain and temperature play a big part and you have to monitor that. Some people don’t realize that it’s not the plants that you water, it’s the roots. The root system is what feeds and nourishes your garden, regardless of what you’re growing. But this is especially so with flowers. Their petals are delicate and sensitive, you can’t dump water on them and expect them to flourish. Instead, be careful to hydrate the soil and roots below, you may even have to use your hands to move or lift their flowers and leaves. 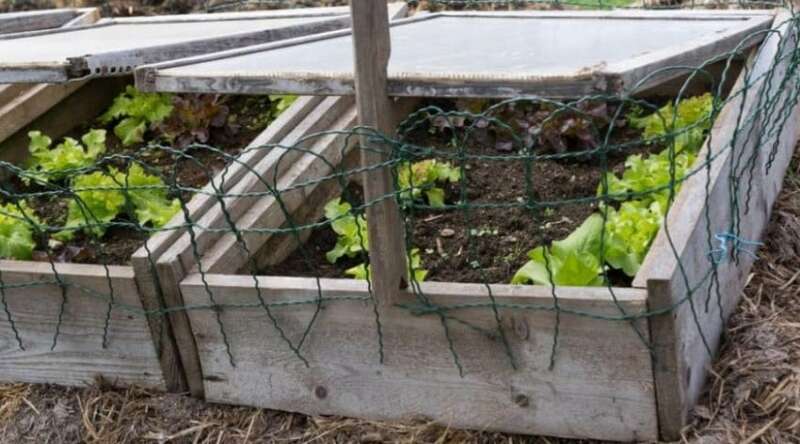 By doing so, you make sure that the water goes where it’s needed and you also prevent the growth of disease on your plants. This is crucial when dealing with edibles such as herbs and veggies. 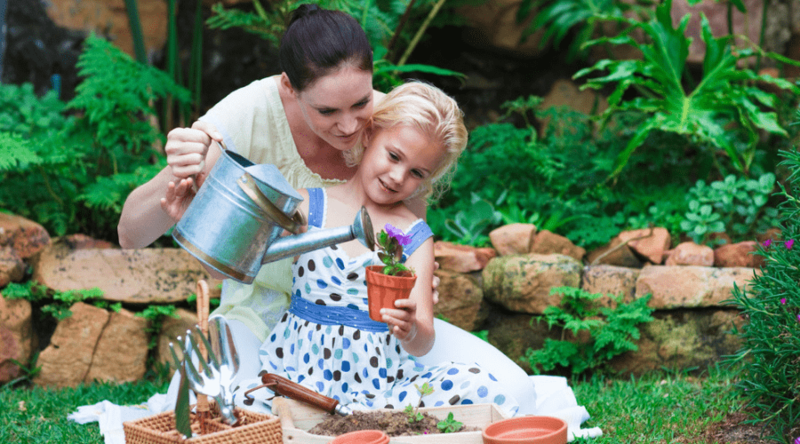 A lot of people think that you should water your plants everyday at the same time. This couldn’t be less true, especially for outdoor plants. With the climate and rain and other factors, your garden may already be getting most of its hydration. But that depends on where you live. If you live in a wet climate or a dry one, take note of how often it rains or how often you see dry, sunny days. Then determine when you should water. Obviously, those who live in coastal climates won’t have to water nearly as often as those who live in the desert areas. You will know when your plants need moisture because they’ll start to show sign of dehydration and the soil will be dry on the surface and about 3-4 inches down. 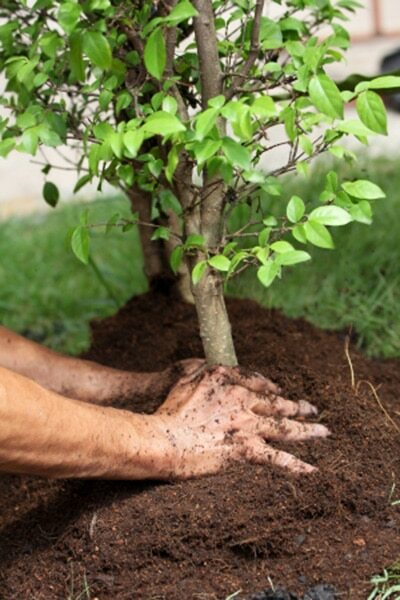 Just make sure the soil around the plants is moist to touch when you press on it. So we’ve covered knowing when to water, but now we’ll talk about how much to water. This wholly depends on what type of vegetation we’re talking about. The grass of your lawn has a massive root system that stays close to the surface and only runs about 6 inches down. For big flowers, thick shrubbery, and trees that occupy your property, their root system runs down about a foot. So these will definitely need a more throughout watering than, say, your lawn. So consider this when planning your day in the garden, or if you use the aids of timers to water your plants. 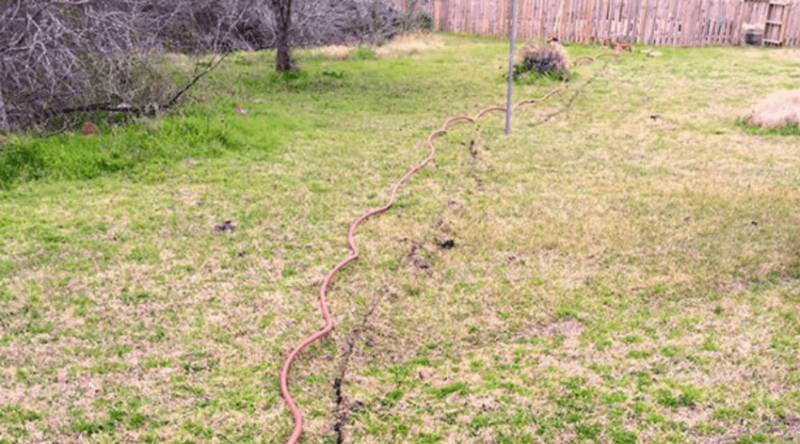 Too little won’t penetrate the soil enough with some, and too long can end up drowning your lawn and causing a mushy surface and even lawn mold. What else do plants require to thrive? Sunlight, right. 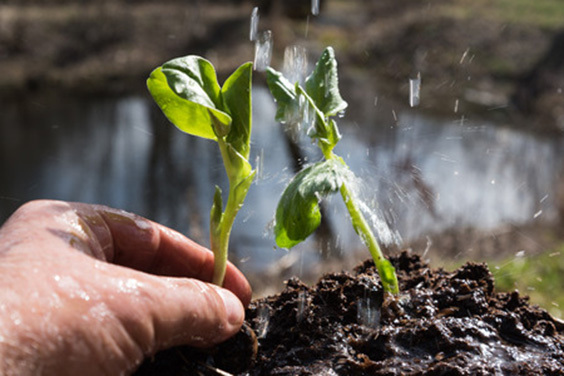 By watering your garden in the morning, you’re giving the plants their best possible start to the day. The combo of hydration and vitamin D helps them flourish during the day and rest at night. Also, if you happen to slightly over water, or get the leaves wet, this gives it time throughout the day to dry off in the warm sun. Another reason not to water at night is because as the weather cools with the setting of the sun, soil hardens and chills. This prevents any major aeration and water distribution. So if you water at night you could risk overdoing it. 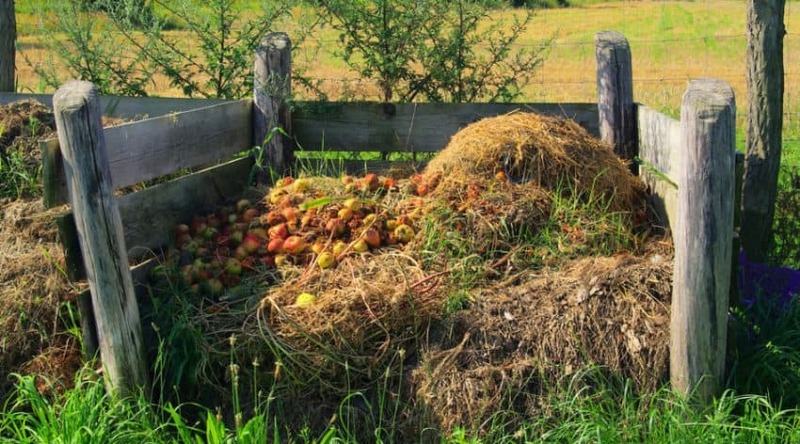 If you want to water less frequently and hope to help your garden hold moisture longer, then consider using mulch. Not only does it make your yard or garden look nicer, it actually serves a purpose. 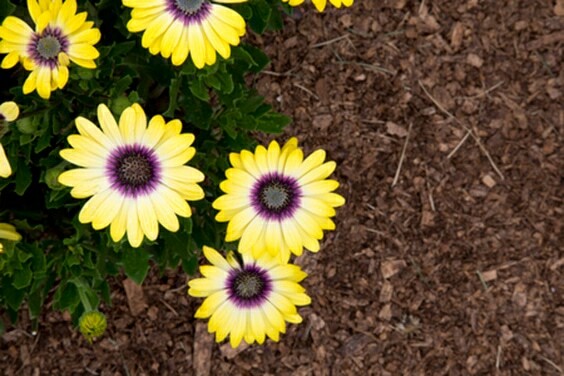 Mulch protects the surface of your soil and helps retain moisture within it. This means less frequent maintenance and is a really great tool to have when looking for tips for watering plants while on vacation. Combine that with the aid of a timed watering system, you’re good to go! 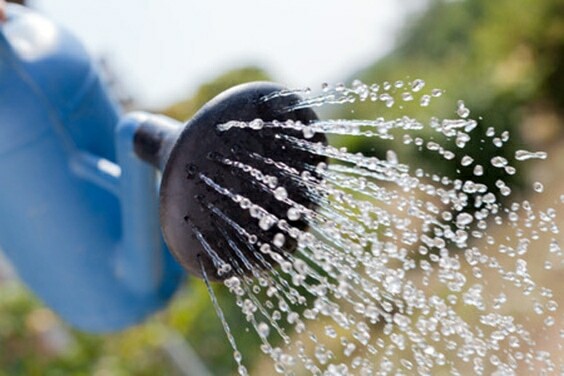 I know this sounds silly, but there are actually special tools that you should use when watering your garden. You can’t just take a bucket of water and pour it over the lot. No, this would lead us back to what we talked about with root systems and over watering. 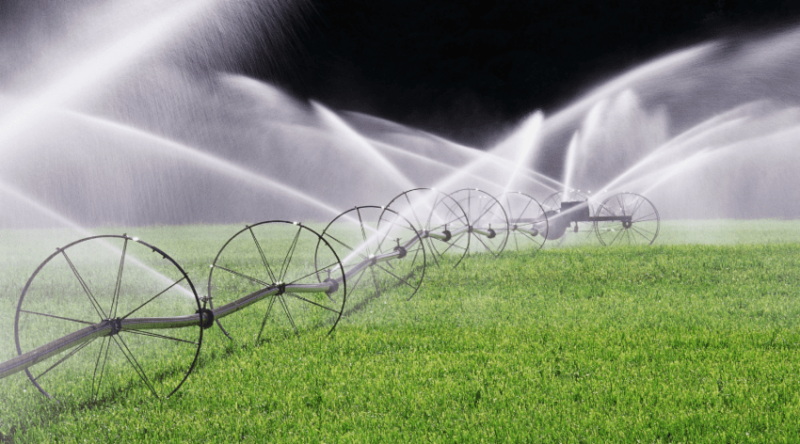 What you should have is a long hose, a watering can with a long spout, sprinklers, and a spray nozzle with different settings. A long hose will ensure that you can reach the furthest area of your garden without problem. 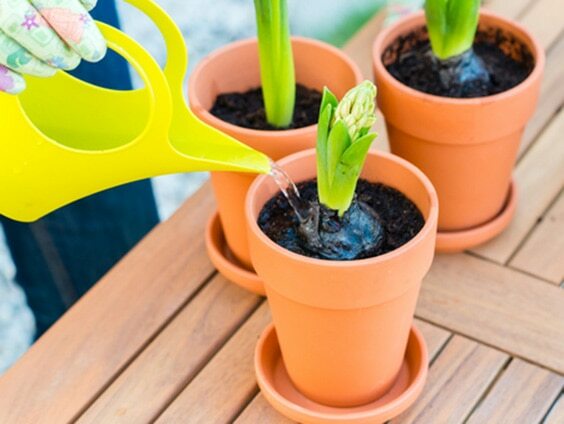 A watering can with a long spout will help you target the root areas and effectively hydrate the soil without getting it all over the leaves and flowers. A spray hose comes in handy for many reasons. When you first start your garden and all you have is fresh soil covering the seeds, then the misting setting will help evenly distribute the water over the soil. During sprouting, turn the setting to localize more efficiently. 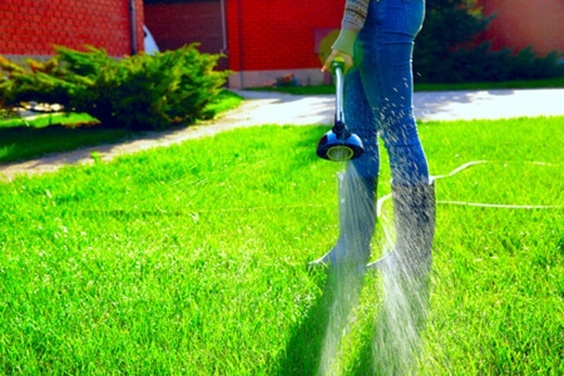 A sprinkler is what you’ll need for properly watering your grass lawn. A hose or watering can is not going to cut it here because of the large area that needs to be covered. One can often do the job, but if you have a large lawn, or multiple lawns, consider investing in two. Indoor, or potted plants, such as tomato plants or ferns need different care and attention when it comes to watering because they’re not exposed to the exterior elements. This means you have more control, and more responsibility, over them. You can get special tools to check the moisture content of your potting soil, but they’re not totally necessary. To check, simply stick your finger about an inch down into the dirt. If it feels moist, you’re good. If it’s fairly dry and the surface is dry, then your plants need watering. Another test is to press on the surface with your fingers and if the soil comes back and feels sponge-like then it’s good for a while. If it feels hard then you definitely need to add some hydration. Checking the soil on a daily basis is one way to monitor this, but here are a few other things to look out for. Different plants show different signs, so it’s good to know them all. The leaves are slow growing. Indoor plants tend to flourish quite fast. So if you’re noticing that the leaves or flowers are not developing as fast as they should be, then you’re probably not watering enough. The leaves are looking a bit translucent. 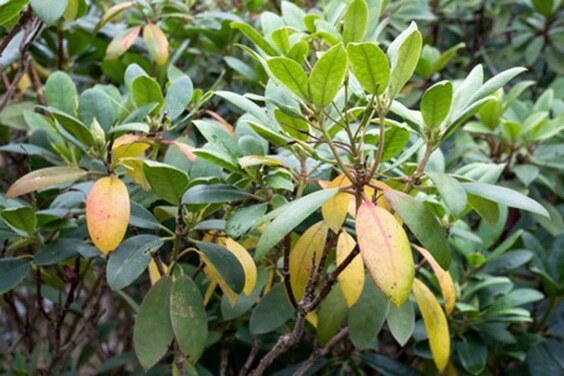 Regardless of the plant, the leaves should be thick, lush, and solid in color. If they appear to be thin and sort of see through, then they’re not getting the hydration they require, or the proper nutrients from the soil. When your leaves or petals fall prematurely. This is a sure sign of dehydration. So if you notice that the potter is beginning to fill up with dead, wilted leaves and flower petals then it’s time to rethink how often you water. This is true regardless if you’re dealing with old or new plants. And lastly, the obvious one. When your leaves become brown, yellowed, and dry. Just like your skin, when you’re dehydrated, it become rough and super dry, right? Same goes for your plants. Don’t be mean, water them. There is such a thing as too much of anything. And overwatering your plants will definitely kill them. It will literally drown them. So, just like you watch out for signs of dehydration, you need to look out for these signs of overhydration. If your plant is young and (used to be) healthy, but the new leaves or petals are falling off the same time as old ones, then you’ve got yourself a case of overwatering. Slow it down. Either do it less frequently, or cut down your amounts each time. Ever hear of root rot? Yep, that’s a thing, and something you definitely need to keep an eye on. If you’re watering too much, that excess will sit on the surface and rot the base of your plants. It’s not always visible, but you can always smell it. Just take a whiff if you suspect root rot and if your plants smell sour then you need to let them breath. With house plants, you need to have an under liner or dish for the pots to sit on that catch the excess water. But this water should evaporate quickly or get soaked back up through the soil when it needs it. If you notice the water in the dish isn’t evaporating after a few days, then stop watering until it’s gone. 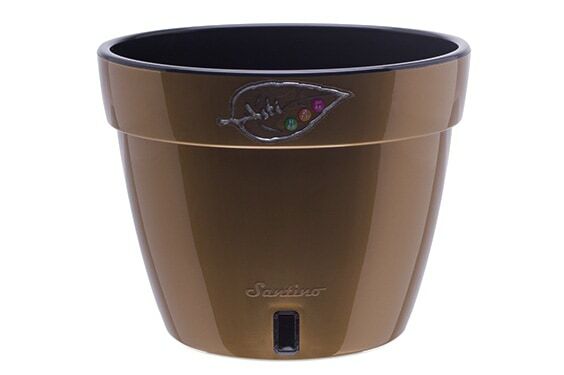 So, if you’re planning a trip away but know that your plants won’t make it without water for that long, then there are some tips for watering plants while on vacation but mostly a self watering device is probably what you should look at. They’re also great if you’re not confident in your ability to stay on top of a watering guide for plants. There’s a few different types, each offering special features. Take a look and see if one is right for you. 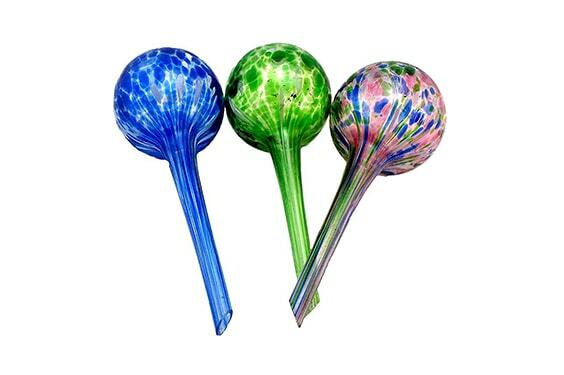 You may have seen these self watering globes on infomercials back in the day. But they stuck around for a reason. They work. Now they’re available in every store where gardening supplies can be found. They work in a way similar to a water dispenser. A round globe sits at the top of a long, narrow tube that gets fed down into the soil. Through the magic of physics, water remains in the globe and only trickles down as the soil requests it. These look and function pretty much like a regular planter but inside there’s a special reservoir where you put a layer of gravel. Then you fill in with soil and plant your plants. The layer of gravel at the base of the self watering pot collects the water run off and feeds it back up through at a slow, steady pace. And there you have it! Pretty much everything you need to know about watering your indoor and outdoor plants. Like any living thing, they’re tricky and require balance, so be sure to devote the time it takes. Did you find it helpful? If you have any questions or tips of your own to add, feel free to comment and share below! 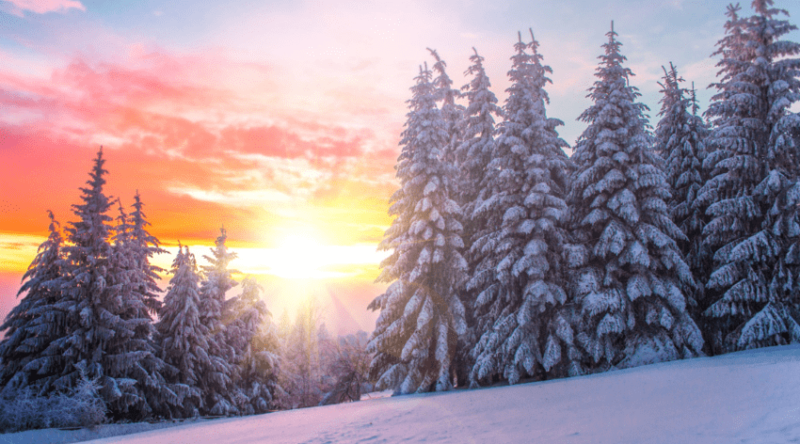 Do Trees Need Water in Winter?